When you think smoothie, do you think of those monster Jamba Juices? They’re healthy, right? Made with real fruit and all those optional add-in boosts like sorbet and non fat yogurt? Here’s a reality check for you: most of the Jamba Juice classic smoothies contain over 100 grams of sugar. THAT IS 23 TEASPOONS OF SUGAR. And we wonder why there’s a diabetes crisis in this country. Ok, so maybe you’re blending your own fruit smoothies at home and leaving out the sorbet and high-sugar yogurt. You’re using delicious mangoes, pineapples, and bananas. That’s healthy, right? No added sugar. The tropical fruits are very high in sugar, and with no protein to balance the sugar, you’ll get a hefty sugar high followed by a crash. Fruit is healthy and contains antioxidants, fiber, and vitamins, but it’s still possible to overdo the sugar here. And we tend to cram the blender full of 3 or more servings of fruit per smoothie. This is not a way to start your day–you’re programming your body to release a surge of insulin (the fat storage hormone) and setting yourself up for blood sugar fluctuations, cravings, and increased hunger for the rest of the day. But smoothies can be done the right way. Want to know how? First tip: DON’T PACK YOUR SMOOTHIE WITH FRUIT. One of the most common mistakes I see people make is grazing on fruit all day long because it’s healthy. Yes, fruit is a healthy treat, but it’s still high in sugar, and it’s still possible to overdo it. Limit fruit intake to 2-3 pieces max per day (1/2 cup or 1 piece is a serving), and if you have a smoothie, be mindful of how many servings of fruit you’re adding. You can make your smoothie fruitless by using 1/2 avocado to make it creamy. Avocados are a great source of fiber and glutathione, a necessary antioxidant for liver cleansing. I typically do 1/2 banana or avocado for creaminess and 1/2 cup frozen berries. Secondly, DON’T ADD FRUIT JUICE TO YOUR SMOOTHIE. Fruit juice is just fiberless liquid sugar. Use coconut milk or almond milk as the base. Coconut water is ok, too. Third, PACK YOUR SMOOTHIE WITH SUPERFOODS. Add a fiber source for satiety and digestive cleansing: I like a combo of ground psyllium, flax, and/or chia seeds. The chia provides some omega 3s, too. I’ll also add walnut or almond butter for good fats + fiber, or tahini (sesame paste). It’s very high in calcium. Add a superfood blend that contains spirulina and chlorella. I like Amazing Grass and PaleoGreens. Sometimes I also add a high quality unsweetened cocoa powder for an extra feel-good antioxidant boost. You could also add bee pollen for immune boosting, raw local honey if you desire a bit of sweet, various spices (cinnamon is good for blood sugar balance), grated ginger root to enhance circulation and improve digestion, or powdered vitamin C or probiotics. The final item to remember is to USE A PROTEIN IN YOUR SMOOTHIE, especially if you’re using it for breakfast. A protein-less smoothie will not sustain you. For a light meal or snack, coconut butter or nut milk may be enough, but I like smoothies for breakfast, and that a’int gonna cut it. Your smoothie should be a mix of good fats (from nut butters, avocado, coconut milk, butter, or oil), protein (from protein powder or gelatin), and carbs (from fruit, veggies, or sweet potato). I typically recommend collagen peptides, high quality whey, or pea protein. I also LOVE LOVE this gelatin-rich delicious paleo protein powder. Avoid soy protein at all costs. It is also highly processed and usually includes soy protein isolates that can cause problems with hormones and thyroid. Click here for my thoughts on protein powders. The less processed the better. If you can handle dairy, I like the Designs for Health WheyMeal whey protein because it is cold processed (the heat in processing/pasteurization destroys the delicate proteins) and is made from raw whey. There is also a dairy free version with pea protein. Grass fed gelatin is great too. 1 scoop Protein Powder as appropriate for you and/or 1-2 tbsp collagen. If you tolerate dairy, try a raw unprocessed whey protein like WheyMeal. For dairy free, try or VegeMeal or PurePaleo. I like Vega vegan protein powders too. 1/2 cup non frozen item like 1 banana, 1/2 banana, 1/2 avocado, couple raw figs, or 1/2 pear (if it’s autumn). OR 1/2 cup cooked sweet potato (steamed ~20 minutes or roasted), mashed. You could get super creative here and use green apples, kiwi, carrots, beets, or anything that appeals to you, especially if you have a VitaMix. I use a mix of fresh and frozen fruit to give my smoothie some thickness. 1/3 cup coconut milk (lite ok) or almond milk. Dump everything in blender and blend. If you have a VitaMix (lucky you), you can use chunkier stuff. See below. You can adapt this by leaving out the sweet potato/avocado and using only nut butter, coconut or almond milk, cocoa powder, and spices. Check out my smoothie pinterest board. I was wondering if frozen fruit is as good for you as fresh fruit. If frozen is all you have on hand, is it worth eating it? Or is it just empty carbs? Frozen fruit is absolutely acceptable. While nothing is as good as fresh, freezing doesn’t necessarily destroy vital nutrients. I’ll buy tons of berries or stone fruits during the summer when they’re overflowing at the markets and freeze them for use in smoothies. Otherwise, I’ll use the Whole Foods frozen organic berries at other times during the year. The smoothies sound wonderful. Care to share the beet recipe one ? I didn’t include it because I just kind of chucked everything in the blender 🙂 It was really good though! 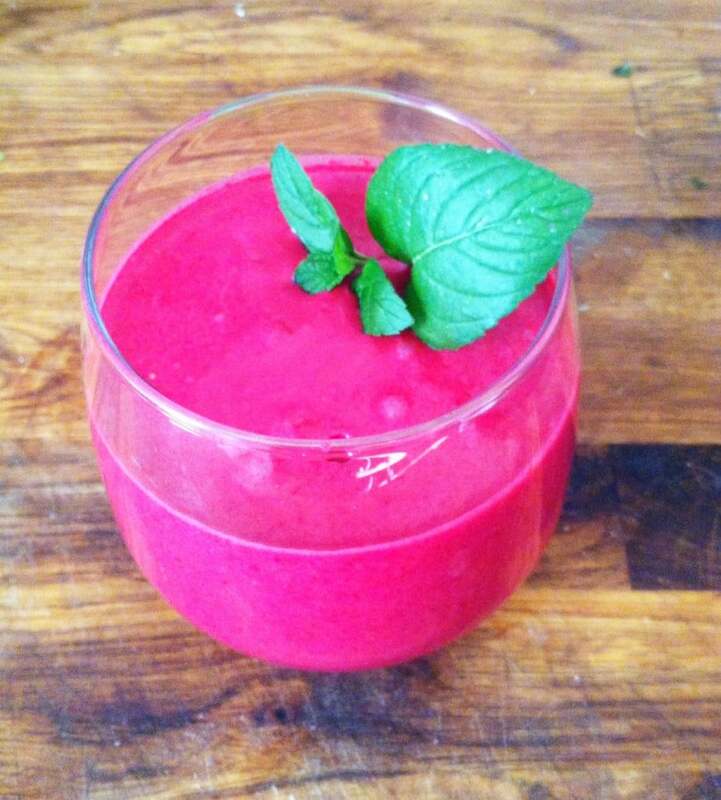 I used 1 small chopped beetroot, 1 handful raspberries, about 1/2 cup coconut milk, 1 tbsp chia seeds, and threw in some mint leaves from my garden. I added water to desired thickness (I like it thick) and blended. Make sure and cut the beet in small chunks unless you have a VitaMix. In regards to chia or added fiber – what’s your take on the website at http://gutsense.com/, which suggests that all this fiber can cause some serious issues of its own. I tend to have a finicky colon and do experience more issues when I increase the fiber. I think your article is spot on, although as a diabetic, I’m pretty limited to a 1/4 cup of berries. An apple, a kiwi and a pear in one smoothie would send me into orbit. I do think that for diabetics the emulsification of all these goodies means that it raises blood sugar quicker than munching away on real foods. For example, I’ll start in the morning with a blood sugar reading of 90 and hit 135 (I don’t take meds for my diabetes) after a shake with minimal berries and full of good fats (coconut butter, avocados, MCT oil,etc). I use two scoops of JJ Virgin’s protein powder (containing pea,potato,chorella proteins) and add kale, the above goodies, coconut milk,Amazing Grass greens, cinnamon, etc. I ponder whether the nutritional goodness of that outweighs the increased glucose levels. I prefer to keep my glucose levels under 120. Wondering if you might have any insights on my situation? Good questions & insight. First off, you are absolutely correct in stating that some people do not fare well with fiber sources: psyllium can be very irritating to the gut if you have GI inflammation or IBS (as can veggies high in insoluble fibers). As for your blood sugar/diabetes question– a smoothie could work for you, but by nature as a liquid, they tend to be absorbed quickly and can spike insulin based on that, even with added protein. If you can’t add fiber, you have one less item to slow release of sugars. Smoothies aren’t right for everyone– they may not work for you if you try my suggestions (about making the fruitless with avocado or pumpkin base) and don’t feel right. I don’t often recommend them for diabetics. My kids and I love smoothies, especially in the summer. Can they be made ahead of time and refrigerated? They can, but depending on what you put in them, it can adversely affect the taste. Gelatin, for example, will thicken it to pudding texture (so will chia seeds). Sometimes the supergreens powder makes it taste funny if too much time goes by. In an attempt to simplify we bought Raw Meal to cover the rice protein, chia seeds, and greens part…only using one scoop and plan to add homemade goat kefir, kale, and some frozen fruit…and maybe coconut oil or nut butter…Since I’m trying to stretch one scoop to 3 categories and feeding it to 2 adults and 2 young kids should I be adding more scoops? Or not cheating and adding the other categories in anyway? Any thoughts on this brand of powder? I like Garden of Life products. 1-2 scoops per perso is typically a serving size. What Gelatin do you use in your smoothies? I was wondering how much Vitamin C powder you recommend for a daily smoothie? Do I start with a small amount and work up? No use in adding more than 500 mg. Your body cannot absorb more than that at a time. I usually make my smoothies with gelatin, berries, banana, lots of fresh spinach, avocado, and water. I don’t see fresh greens mentioned in your post, though. Wondering why? Thanks! Hi: Great site! Just wondering about your take on protein powders. I know WAPF says they are a no go. Thanks for all your wonderful information! I tend not to add veggies to fruit smoothies because the supergreens blends I use are a combo of greens and sea vegetables. Hi Mary, I was wondering if you have tried a pea protein in your shakes? The company I work for makes vegan protein shakes with Pea, Cranberry, and brown rice protein instead of whey, dairy or soy. They are so much better on the stomach… and, although I can only say I have tried the chocolate so far; they are amazing. I have been blending the protein with Sambazon’s frozen Acai packs and Silk Vanilla Almond Milk. Would you see this more as a morning shake, or a after workout shake? Should I add anything else? yes, i like pea protein. As I mention in the article, I try and pack more nutrients in a morning shake, and what you describe sounds a little light. I would add good fats, chia or flax, superfood greens, etc for a morning smoothie.